For years, stringent federal regulations have cluttered the skies for commercial drone use, and companies eager to capitalize on the business potential of unmanned aircraft have chafed under the constraints. Those clouds began to part last month when the Federal Aviation Administration (FAA) released new and less strict regulations for commercial drones, and there’s a buzz of excitement in the air surrounding the drone community. 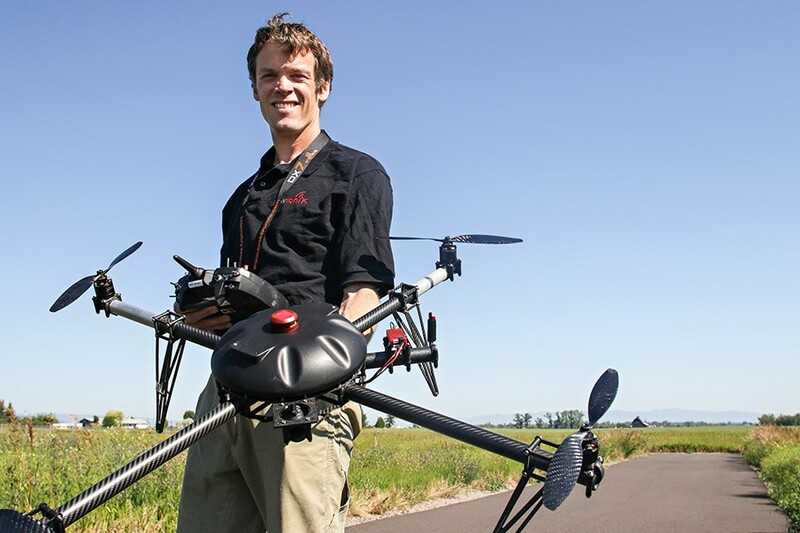 Soon, due in part to the technological advancements of a Flathead Valley company, there could also be the buzz of new drones taking flight. “We are part of a new era in aviation, and the potential for unmanned aircraft will make it safer and easier to do certain jobs, gather information, and deploy disaster relief,” U.S. Transportation Secretary Anthony Foxx said when making the announcement. The new FAA rule governing small unmanned aircraft, called Part 107, streamlines the use of drones by commercial, non-hobbyist operators and makes it easier for them to get off the ground, especially because the agency no longer requires remote pilots to obtain a private aircraft pilot’s license. Instead, they’ll be able to obtain a remote pilot airman certificate by passing a test, which will cost about $150, the FAA estimates. When the new rule becomes effective in August, most experts expect the use of these devices to proliferate. According to industry estimates by the FAA, the rule could generate more than $82 billion for the U.S. economy and create more than 100,000 new jobs within a decade. But the new rule is replete with safety regulations for unmanned aircraft weighing less than 55 pounds and imposes a raft of operational limitations. Perhaps most prominently, those limitations include a visual line-of-sight condition, meaning the unmanned aircraft must remain within eyeshot of the remote pilot at all times. That means no cross-town deliveries from Amazon.com or Domino’s. However, the FAA also notes that many of the operational restrictions in the new rule can be waived, and it will assess commercial requests on a case-by-case basis. The rule notes that technology such as Automatic Dependent Surveillance-Broadcast, or ADS-B—a satellite-based surveillance technology used by air traffic controllers—can be a mitigating factor for a person to support a waiver application, showing that the operation could safely be conducted under the terms of a certificate of waiver. The problem is, ADS-B systems are bulky, heavy and expensive—an impractical fit for small Unmanned Aircraft Systems. But a local company has developed a 20-gram solution to that conundrum. Bigfork-based uAvionix has developed the world’s smallest, lightest and most affordable ADS-B transceiver tailored specifically for UAS navigation. Called the Ping2020, the transceiver allows aircraft operators to sense and avoid possible collisions through a constant exchange of real time position data. Paul Beard, CEO of uAvionix and a Bigfork resident, likened the developments in the drone world to the early realization that the Internet might be a watershed moment, and as the federal government slowly lifts the lid off the regulatory pot, his technology provides an early opportunity for commercial drone use. The drone industry has grown quickly since 2008, particularly among people who use photography in their businesses. In 2012, Congress directed the FAA to study the public and national security risks and, if appropriate, to establish new standards. Indeed, the popularity of drones is not without concerns, with safety operations and manned aircraft interference chief among them. “We offer a unique opportunity for industries to equip their unmanned aircraft with an additional layer of safety and continue flying beyond the visual line of sight,” Paugh said. For more information about uAvionix, visit the company’s website at uavionix.com.